Sutherland Presses is seeking to grow our global network of Certified Press Technicians. Our contracted technicians are the backbone of our business, providing the frontline support that our customers depend on. Technicians are hired for projects related to every aspect of our service offerings, including installation of presses, preventative maintenance visits, and emergency repairs. To become a Sutherland Certified Press Technician, you must complete a rigorous training and evaluation program designed with equal attention to both technical knowledge and service skills. We believe that effective communication and courteous service are just as important as knowing the machines inside and out. Sutherland Presses has customers all over the world, so this position is open to any qualified technician in any country. 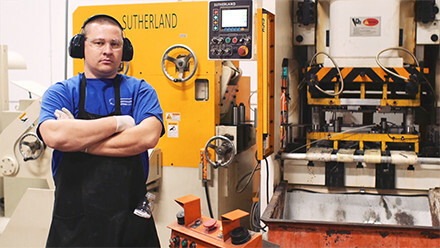 Perform service projects for Sutherland customers, including new installs, repairs, and preventative maintenance for mechanical, hydraulic, and forge presses, as well as the Sutherland I-PRESS control system. Competitively quote new projects for Sutherland in a timely manner. Work with the Sutherland team to evaluate service jobs and identify challenges and opportunities. Conduct all visits and communications with professionalism and courtesy, representing the Sutherland brand with passion and positivity. Arrive on-time for service visits, wearing the provided Sutherland Technician attire. Train customer personnel on all aspects of their Sutherland Press and I-PRESS control, including operation, setup, and maintenance. Capture service project information using Sutherland’s digital forms (InspectAll). Collect information on customer needs, concerns, questions, new staff members, and any upcoming press or service needs.